Those chaps over at Master of Malt have been at it again with their experimentation, this time in the world of aged gins. If you are looking for a spirit that will please someone who is both a gin and a whisky lover, then definitely check out their range of aged gins. Here are some highlights from 2015. Subtly aged in an ex-Ardbeg Islay whisky cask. Nose: Light, with some deeper herbal notes and a little sticky fruitiness, followed by wisps of wood smoke. Taste: A full texture that fills the mouth, whilst not being too thick. Strong, herbaceous botanical notes come through, before a light, woody sweetness. The dry wood smoke notes build on the finish and linger for minutes after. Bathtub gin aged for 10 months in an ex-rum cask. Nose: Sweet molasses and allspice, somewhat reminiscent of Pimento Dram. There are also the sweet, herbaceous notes that evoke memories of old-time curiosity cola and some hints of Jamaican Ginger Cake, too. Taste: Sweet and spice, with a little stickiness upfront, followed by woody spice – cassia, cinnamon, and nutmeg – before some bitter, herbal treacle notes and a woody and dry botanical finish. Bathtub gin aged for 9 month in a cask that was previously use to barrel-aged a Manhattan cocktail. Nose: Deep orange marmalade and woody, herbal notes of aromatic bitters, then some light, woody resin and bread notes with just a touch of wormwood. Taste: Citrus notes of burnt orange upfront, before the dry, mellow, woody breadiness of rye, before a burst of spice and a botanical sweetness. This is followed by juniper and angelica notes, and an exceptionally long and lightly sweet finish of floral rose and turkish delight. Bathtub gin aged in an ex-whisky bitters cask. Nose: Quite light, with some vanilla spice, moving towards hints of gentian root and the aromatics of cocktail bitters. Taste: This has mellow aged gin notes to start, followed by a bitter, earthy woodiness, along with a touch of a maple-like sweetness. There is dry juniper on the finish. Based on a blend of both aged and unaged spirits, cold distilled botanicals are then added before a maceration of juniper berries and a light sweetening. The spirit is finished in a 50 litre casks for 5 months. Nose: This has a deep complexity, with the notes revealing themselves over time. There are some orange a woody notes to start, followed by a honeyed sweetness and notes of orange blossom, cherry, and other stone fruit. Finally, there’s a dryer, woody nuttiness. Taste: A lovely texture: thick, like maple syrup. Like on the nose, rich, sweet orange and marmalade notes come forward, before some intense botanical notes: fresh juniper, woody angelica, and then citrus spice. The finish is similar to that of a Highland malt, with burnt citrus and nutty pecan notes. This is very complex and should appeal to whisky drinkers. Part of an experimental range released by the professor, this gin takes Scottish malt spirit and re-distills it with botanicals under a vacuum. The spirit is then aged in England in a cask previously used for a batch of FEW Barrel-Aged American Gin. Nose: Quite creamy, with vanilla notes followed by a hint of dry spice, reminiscent of homemade custard or crème anglais. Taste: Powerful spirit, but also rather smooth and an almost liqueur-like texture to begin with, along with a creaminess, courtesy of the barley spirit base. There is a fair amount of sweetness, and the spice of a dry gingerbread cookie. The finish is more gin-like, with citrus and juniper. A very long, winding finish. The latest addition to the Professor’s range of creatively-aged gins, this has been matured in a 50 liter cask that had previously contained a batch of Old Fashioned cocktail. Nose: Honey and orange, with hints of spice and whiskey, much like a good whiskey liqueur. Taste: Very soft, velvety, and full-bodied. There are wood notes upfront, with sweetness and spice, as well as a touch of whisky smoke and burnt orange. The flavor then shifts to more traditional gin notes: juniper, angelica, citrus, and a slightly floral flair, somewhat reminiscent of violets and root beer. When I spoke to Ben Ellefsen (a close associate of Professor Cornelius Ampleforth) at a tasting last summer and he hinted that there were more innovative aged gins in the pipeline, I was excited. 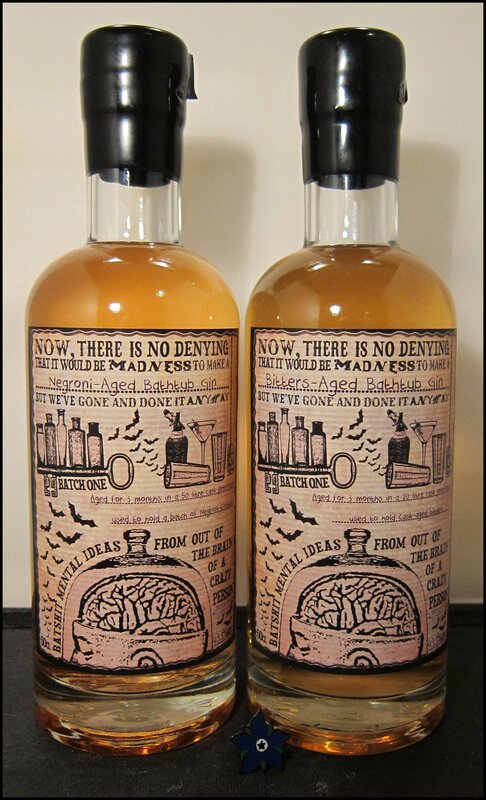 Master of Malt have already created some superb gins under their “Batshit Mental Range”, including Old Fashioned Cask aged and Anglo-Scottish-American gin. After a six month wait, the new year kicked off in splendid form with the announcement that a series of four aged gins were to be released, all based on their Bathtub Gin and bottled at 43.3% ABV; the only variation between them is the cask that they are stored in. The gins are aged in casks which were previously used to finish their Darkness! Single Malt Whisky range (these are Scotch whiskies that are finished in ex-sherry casks). Nose: Dry elements towards the end, with a touch of nutmeg and vanilla. Taste: A good, dry flavour and a woody bitterness towards the finish. There is also a slightly sour, briney quality and a slight astringent note. Quite intense, but different from the wood and winter spice of many other aged gins. The dryness of the base spirit really comes through. There’s a good, long finish that is quite excellent, unlike much as the marked, minimal sweetness. Nose: Sweet orange, marmalade, and warm spice, with hints of dark fruit and jam; almost a touch of vermouth. Taste: A full texture, rich and fruity, with plenty of citrus that reminds me of Dundee marmalade. There’s a warmth on the finish and a little heat; this is brighter, bolder, and spicier than the Abelour version, as well as being more like a mainstream aged gin. More wood notes come through, too. Nose: Woody with some crisp juniper; dry and piney, with some light, floral notes from coriander and then some warm spice and woody notes: vanilla, cinnamon, and nutmeg. Taste: Some sweet bourbon-esque character, before a more balanced flavour with dry gin and juniper notes that move towards a nutty finish with a hint of marzipan. Well-integrated and a lovely introduction to the category of aged gin. The use of unusual casks to age gin are an identified trend for the spirit in 2015 and these examples certainly qualify. I was genuinely surprised at how different the spirits were and all were rather tasty, the folks at Master of Malt and Maverick Drinks have done it again! Darkness! Bathtub Aged Gin Abelour, Ardbeg, Clynelish, Macallan are available for around £30 for 500ml. There have been a lot of recent releases and developments in the world of aged/yellow/amber gin and today we feature two more exciting barrel-aged gins. Gone are the days when gin was simply aged in ex-bourbon or wine casks; Herno have launched their Juniper Cask gin last year and today’s featured spirits are just as innovative. Based on the Master of Malt’s Bathtub Gin, or rather the company’s in-house eccentric Professor Cornelius Ampleforth’s bathtub creation, the first gin is aged for 3 months in a 50 litre barrel that had previously held a Negroni cocktail. Nose: Juniper and strong, herbal, woody notes. Taste: This is a spicy gin with a little sweetness and the bold bitterness that you’d expect from a Negroni. It’s a mellow flavour overall, but the character of the Negroni really comes through from the barrel. Sipping-wise, it is very balanced and intriguing. There’s a lot going on in this drink and it is almost reminiscent of a pink Gin & Tonic, however some how it seems a bit too sweet without a garnish. However, with a slice of ruby or pink grapefruit, the drinks transforms, achieves balance, and is a lot more palatable. I’d stick to drinking this gin in other ways, though. A very intense and flavourful Martini, with elements that you would expect from a Negoni (namely, herbal bitterness and spice) mingling with the more traditional Martini flavours. This reminds me somewhat of a sweet Martini and would be excellent as an aperitif. A very smooth and slightly sweet Negroni, with layers and layers of intense flavour. There is citrus sweetness, followed by a more spicy sweetness, as well as hints of oak and vanilla. There is then a dry, herbal bitterness. Despite the intensity of flavour, the bitterness is a matured, mellow flavour. Unlike anything else you’ll try. So a gin aged in a Negroni Barrel is pretty unique right? Well, what about one aged in a barrel that used to hold aromatic bitters? Well, the folks at Master of Malt, again led by the good Professor, have gone there and the result is their Bathtub Bitters-Aged Gin. This time, Master of Malt took a batch of their Bathtub Gin and aged it for three months in a 20 liter cask that had previously held cask-aged bitters. Nose: Lots of spice, nutmeg, cinnamon and cassia. Taste: Sweetness upfront, then plenty of confectionery cinnamon and cassia, reminiscent of Christmas spiced cookies and pumpkin pie. Finally, there is a more intense bitterness and the juniper comes through. Extremely intense in flavour, this has plenty of mixing potential. A rather spicy Gin & Tonic, packed with flavour. But unlike some spicy gins, the sweetness is balanced by dry and bitter flavours, which stops it from tasting like a Christmas pudding. I particularly like how the gentian-like bitterness from the spirit pairs well with the quinine of the tonic water on the finish. This is a more spicy Martini than most, with unusual confectionery notes, lots of vanilla, raisin, cinnamon, and nutmeg, like a simnel cake or Christmas fruit slice. This certainly reveals the softer side of the spirit, but, nonetheless, it’s rather good and quite smooth. More of an after-dinner than than a pre-dinner drink. Exceptionally intense and flavoursome; beyond the aromatic spices that you may expect (nutmeg, cinnamon, cassia, clove), there are some deep, bitter, earthy herbal notes that strike a chord between the gin and the Campari. This bold drink is excellent; definitely one for the Negroni fan who thinks that they’ve seen it all. Just don’t have it before a tasting – the flavour lingers on and on and on! I really like both gins, but, for me, the Negroni-cask just eeks out the lead; it is superb on its own, from the freezer, or even mixed with extra Campari and vermouth for a sort of turbo Negroni. For me, the Bitters-aged Gin has great digestif properties and I particularly liked the Martini and Negroni. This week will feature a variety of article focused on yellow gin/aged gin, in 2011, I made a prediction that 2012 would be the year of aged/yellow/matured gin but although there were a few new products 2013 has really been the year of yellow gin and my predictions seem to have been 12 months early. This article will feature Bathtub Navy Gin, which by my reckoning is the first aged gin commercial available. * This is an aged version of the navy strength Bathtub gin we tasted at out navy strength tasting. Nose: Dry Christmas spice: cinnamon, cassia, nutmeg and cloves, but a little woody vanilla, too. Softer than the nose for the regular Bathtub Navy. Taste: Superb – has a texture that just expands in your mouth; something that’s really rather different. It’s also rather smooth for 57% ABV. There’s lots of spice upfront, with a slight confectionery quality, too, reminding me of Easter cake or a Tiffin Slice (essentially, light Christmas pudding). Finally, there’s an unusual finish of sarsaparilla, cherry and almond, with just a hint of pine sap. Looks like fizzy pastis, but has a rather nice flavour. I’m reminded again of pastis, as the spice flavour comes through: cloves, nutmeg, cinnamon and a little anise. There are notes of vanilla, too, as well as a dry finish. In terms of flavour and appearance, this is a very unusual and herbal Gin & Tonic, but it definitely has something going for it and I’ll certainly have another. Mrs. B found it delightful, too. A beautiful Martini, golden in colour and very intense and fragrant. There’s dry juniper, then some sweet vanilla and cardamom, followed by oak vanilla notes and some winter spice, such as cinnamon and nutmeg. The finish is green, herbal and slightly leafy. Very, very flavourful and really rather lovely – invigorating, even. To start, there’s an intriguing rosemary nose, but then when to taste it, boy! does this make a super Negroni. You get the woody vanilla notes upfront, followed by the nutmeg and cassia spice. Then there are some more herbal notes, the dry juniper and – finally – the deep, dark, more intensely bitter herbal notes that are normally associated with the Negroni. This drink certainly has impact and is one for the Negroni fan. Cask-Aged Gin Navy-Strength is available from Master of Malt for around £35 for 50cl. *NY DIstilling Barrel-aged their Perry’s Tot but do not sell it by the bottle. Today’s whiskey liqueur is made by the Tunbridge Wells Liqueur Co., a sub-brand of Master of Malt, who, in addition to having an award-winning online retail site (where you can buy wonderful 30ml samples of whiskies), have an impressive array of their own products, ranging from handmade cocktails to Bathtub Gin. The liqueur (bottled at 29.9% ABV) combines Kentucky Bourbon and fine Canadian maple syrup, with the aim of producing a tasty liqueur encompassing the benefits of each. Here are my thoughts. Nose: Initially, familiar notes of bourbon are aplenty, only sweeter and richer. Then, all of a sudden, unexpected notes of spice kick in, accompanied by cloves and black liquorice. After a little warming, rich, thick maple syrup notes are evident, with hints of cherry, but at no point do they take over – the bourbon and spice are always there, making for an interesting and three-dimensional nose. Taste: A smooth sweetness to start, along with more complex notes of liquorice, treacle, and lightly spiced oak. The viscosity and distinct flavour of syrup then come into play, but those woody notes of liquorice continue to neatly balance this out, stopping it from becoming overly-sugary. Finish: Vanilla and maple syrup with the dryness of liquorice root. At the very end, a faint hint of tart fruit, like cherries or blackcurrants. Nose: Much sweeter and lighter, with more maple and a faint, herbal edge. Taste: Again, this is more smooth and less viscous, making it much more refreshing and a perfect serve for summer. Lighter on the palate, it seems more dessert-like, reminding me of pancakes with maple syrup and slightly melted vanilla ice-cream. After a few sips, the richer, spiced notes build up so that you get some of the more dry, complex flavours of liquorice and dark chocolate. Served at an impressive -1 degrees Celsius, this is more viscous, complex and bold, with a good deal more of the maple coming through. There are also strong notes of treacle, liquorice and just a hint of cloves. More than in any of the other serves, there’s also a notable warmth to the finish, which is of cinnamon, oak and treacle. Delicious! A lemon freshness to start, which gradually develops into a creamy vanilla note that continues throughout. There’s a short burst of maple sweetness, before dryer, lightly spiced oak. Finally, the fresh notes of lemon returns. The finish is of lemon sherbets, cinnamon, the flavour – but not the sweetness – of maple syrup, and creamy vanilla. This blurs into a final, lingering note of lemon, making it somewhat reminiscent of a smooth lemon cheesecake. This is delicious: a superb pairing of smooth, but intense notes of maple syrup and classic bourbon flavours. It’s not too sweet and is just complex enough to be interesting, without being fussy. Not only that, but I could drink it at any time of year in any one of the serves that I tried today; my favourite was straight from the freezer. Very good, indeed. You can buy Maple Whiskey Liqueur from Master of Malt at £27.95 for 50cl. Origin Single Estate Juniper Gins, Navy Strength Gin, Summer Fruit Cup, Leap Year Cocktail, Maple Whisky and many many others. Today, I shall be looking at Cream Gin. Such gins were popular in the Gin Palaces of the Victorian Era and can be seen in pictures of bars of the time (see below); although the exact contents and process of making the gin is not 100% clear, it was probably gin mixed with cream and sugar and left in barrel to soften the spirit’s harshness (as discussed between creators Ryan and Ben here). Nose: Juniper upfront, along with a little coriander. Taste: Juniper, black pepper and some coriander. A little cream towards the end, but it’s quite subtle; it is with time, as you continue to drink it, that the creaminess builds up and you can really appreciate the distinguishing features of this gin. It also really opens up with water. Very fine, with some vanilla and a touch of cream; very refreshing, with citrus and coriander. Very good, indeed. A strong, crisp and cooling Martini with a creamy finish, in part due to the vermouth, in part due to the gin. Quite simple, but smooth and pleasant. Very good – extremely smooth and silky, helped by a good amount of creaminess from the gin. There’s still a good bitter-sweet balance, as well as a slight hint of nuts. Different, but good. Another sweet, herbal, creamy drink that’s very good. Comforting and invigorating and very, very smooth. Due to some miscalculations regarding the quantities in my drink, I ended up with a pint of Ramos Gin Fizz, but that was fine with me, because it was rather delicious: a great mix of citrus and cream, much like a syllabub or tart au citron. The gin adds a little dry juniper, but also contributes to a more silky and buttery finish. Very good. Really lovely: the combination of flavours go together exceptionally well, producing a rich and creamy, but not too sickly, cocktail. This drink is really a natural match for the gin. This starts off as a pretty standard French ‘75, but concludes with a creamy, almost buttery finish. Softer and less dry than many. Quite sweet, but simply blissful, with the cream from the gin, the chocolate of the Cacao, and the herbal warmth of the ginger, all whilst the dryness of the juniper adds a bit of balance. Sumptuously superb! I didn’t have vanilla salt, so I dabbed some vanilla essence around the rim of the glass and used ordinary salt instead. It is quite common for gin in Africa to be drunk with Coca Cola (something of a status symbol in itself) and this is a common way for Uganda Waragi to be drunk. Even without the vanilla salt, I think that the drink works well, but the garnish adds that extra flair. The vanilla works well with the gin and cola, reminding me of Coca Cola Vanilla, which was once available in the UK. Whilst this drink is, on the face of it, simply gin and coke, it actually has many layers and is worth trying. I always applaud any innovations in gin, especially those inspired by history, and Cream Gin is an excellent example of just such an innovation. Although it worked well in some of the classic cocktails, I think that the variations and creations tailored to this rather unusual spirit work best (see #9 and #10). *Named in recognition of Edward VII (the King of King’s Ginger), who started the fashion of a gentleman keeping the bottom button of his waistcoat unfastened. Also, in reference to chocolate buttons.